Often we find ourselves too immersed in task management and productivity applications like Asana. We don't seem to be able to step back a bit. We need to look at the bigger picture. Try Weekdone's one-click Asana reporting. We help you better understand and analyze your team's Asana data. The weekly or monthly Asana dashboard report makes your information instantly actionable towards your people. 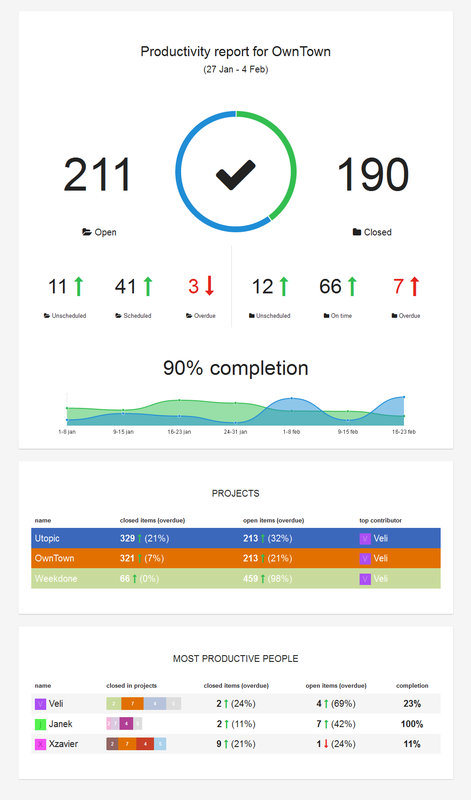 It's a visual, easy, yet comprehensive overview of your team's Asana productivity. Connect, pick your workspace and get a pretty printable report for your team's weekly Asana performance. It's fully automated - no additional work needed. Once per week we analyze your Asana data and deliver you the report. "It is not enough to be busy ... The question is: what are we busy about?"